See the capabilities of our facility, machines, and staff for yourself by viewing the galleries above. We are giving you a first-hand look into our work with images, videos, case studies, and product galleries that will demonstrate our capabilities and SHOW the precision and accuracy produced in every part machined by Owens Industries. Each of our capabilities galleries showcase the tight tolerances and micron accuracies our state-of-the-art CNC machines achieve, along with the quality and precision Owens’ dedicated staff strives for on each job we complete. From industries, applications, and component specifications to images of our facility, machines, and people, you will find everything you want to know about Owens Industries here. After seeing the incredibly complex work completed by our machinists, call our Wisconsin Machine Shop today to get a quote on your CNC machining needs. Owens Industries offers everything for businesses just like yours, from 5-axis machining to sinker EDM. Owens Industries goes beyond the capabilities of normal CNC machine shops, helping you achieve the tight tolerances and ultra-precision our competitors can only dream of accomplishing. If other CNC machine shops can’t do it, Owens wants to! Give us a call today to discuss the manufacturability of your design ideas or to learn more about the capabilities of our facility, machines, and staff. Wire EDM - a very detailed process that entails using a thin wire as an electrode to cut a material (workpiece) with a spark. This process produces an extremely accurate cut and quality finish, even on the smallest of products. Micromachining - refers to the precise milling and manufacturing of extremely small parts and products. These components can be cut down to one-thousandth of a millimeter, helping make the production of micron parts more efficient and realistic. CNC Swiss Machining - This type of CNC machining rotates components radially when cutting them. This type of specialized tool cutting allows the machine to perform several operations at once in a shorter amount of time. Deburring - Components have a tendency to become burred when edges become too sharp or compressed. Owens' deburring service is used to neaten and smooth the rough edges or ridges of a component, making sure it continues to work well. 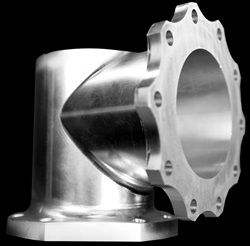 Contact our 5 Axis and EDM machinists to discuss your prototype and the manufacturability of your designs.